i Taught a swim lesson tonight and was able to get in a few hundred yards before, during & after the lesson. I’ve been having trouble focusing on my form…it’s like I don’t want to go back to basics, or when I try some of the basic focuses, my stroke doesn’t feel smooth and connected…my breathing doesn’t feel smooth and I get frustrated. Tonight I decided to do a stroke counting set of trying to start at 16 strokes and increase by 1 with each 25. 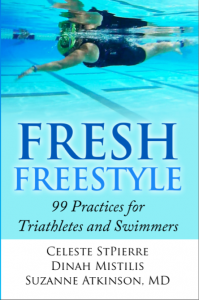 By mere fact of trying to attain a specific stroke count, which gave purpose to my swim, I suddenly felt connected and smooth in the water. My first 25 was 15 strokes! I tried to increase the tempo just a hair and hit 15 strokes again. 3rd 25 was 17 strokes and the 4th was 18. I’ve got no clue what the time was, but at the end I was slightly out of breath and had a “sensation” of a 1:40 100. What amazed me about that single 100 is that at this point, having worked t hrough a number of focal points over the past 10 months (scores possibly), I still feel like I’m learning all over again. I find myself frustrated at the lack of fitness, or rather a noticable decline of endurance ability. A better way to describe it would be the inability to maintain good movement for a sustained period of time, regardless of speed. This is as much a fine motor-neural tuning task as it is localized muscle endurance of the muscles specific to swimming. But in that single 100 I finished the day with, I suddenly injected a “purpose” into my swim above and beyond the movement itself. When I focused on the purpose of hte movement (calibrating strokes) the movements suddenly felt effortless and fluent. By that time there was so much odor of cleaning solution from the locker rooms hovering just above the surface of the pool that I decided to call it quits. It was closing time anyway.